I love the Winter Meetings. As someone who has always been fascinated by player movement and who collects baseball cards based around roster construction, there are few more exciting times of the year for those like me. The wheeling and dealing has been going full-steam now, since the much ballyhooed- trade of Giancarlo Stanton and signing of Shohei Ohtani (who's apparently injured? Yikes). So far, as part of the winter festivities in Florida, Theo Epstein and Jed Hoyer have given Cubs fans the gifts of Tyler Chatwood and Brandon Morrow. These two exciting additions fortify the starting rotation and the decimated bullpen, which brings a smile to my face as I add their cards to my CATRC binder. Speaking of which, Theo and Jed still weren't quite done bringing "smiles" to Chicago just yet. Last night, while I was holed up in a movie theater, finally viewing Thor: Ragnarok as prep for the upcoming Avengers: Civil War (great film & surprisingly funny! ), the Cubs front office brass made their third big move of the winter season. As I watched the God of Thunder ascend to the throne of Asgard, Drew Smyly reportedly inked a two-year deal with the North Siders, worth $10 million guaranteed. Luckily, I had this 2017 Bunt single in my trade stacks, along with a handful of other cards featuring the Cubs newest hurler. While Smyly is an accomplished starter and the Cubs are still looking to fill a slot in the rotation, this move appears to be more about 2019 than 2018. After all, Smyly underwent Tommy John surgery last June, which ultimately lead to his being non-tendered by the Mariners without having pitched a single frame for the club. Thus, the earliest that we can expect Smyly back on the mound and in a Cubs uniform is after the All Star break (and probably later than that). Accordingly, his contract is structured so that he'll receive a $3MM salary in '18, then $7MM in '19. So, with a club that's become World Series or bust, why bother with a rehab project like Guy Smyly here? Does this big market contender really need to go "dumpster diving?" Yes - absolutely. The longtime top prospect in the Tigers system has proven to be an effective mound presence, when healthy. He holds a career 3.74 ERA and is just a year removed from a 30-start, 175.1 IP, 2.0-WAR season in 2016 - with pitching being such a desired and expensive commodity, locking down another rotation option is never a bad idea. Not to mention, after having spent several years with the Rays, he is quite familiar with the Joe Maddon and his new, old pitching coach Jim Hickey. Lastly, though this move is definitely more about next year than this one, perhaps Smyly can come back by September and provide some relief for what is sure to be a beleaguered bullpen, one of the downfalls of last year's Cubs team. All in all, the Cubs secured themselves a potential bargain. Of course, the deal is still fraught with risk, but that's what the market is like right now. Here's hoping Smyly is feeling smiley come next fall. However, that being acknowledged, I don't think that the Smyly signing will be the final move. I mean, the Cubs still have a rotation gap to fill and have been linked to Alex Cobb, Danny Salazar, Danny Duffy, and (as per yearly tradition) Chris Archer in the last 48 hours. Furthermore, they have also previously stated a desire to add one or two more late-inning options (besides Morrow), with names like Addison Reed, Alex Colome, and Jake McGee being connected to the club. 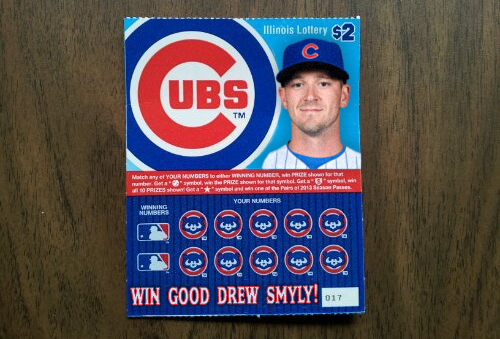 The way I see it, Smyly is like that scratch off lottery ticket that you pick up on your way to the register at the grocery store, just because. 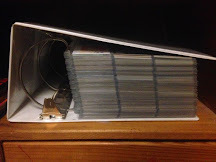 That said, I could also be way off base - I'm no insider, I'm just a rabid Cubs fan with a blog about baseball cards. I guess we'll just have to see how the last two days of the Winter Meetings play out, huh? At any rate, welcome to Chicago, Drew Smyly. Fingers crossed that you rehab goes as planned and you give Windy City sportswriters plenty of opportunities to make terrible puns based on your last name. I am a big fan of Smyly no matter where he pitches. Haha, I was like "is that seriously a lottery ticket?" I'm a fan of these types of moves.